We are in a rut at our house when it comes to snacks. I try to provide healthy snacks for the kids when they come home from school, but we're just bored. So last week I decided to try something new. I love the website Super Healthy Kids, so that is the first place I looked. So the littles and I went to work to make a new snack. Everyone thought they were good! Even the big boys! I've got a new snack to add to my list! In a small bowl, add the water, sugar, yeast. Let sit for a few minutes until it starts to bubble. Meanwhile, in a mixer add the flour, salt, and baking powder and mix until blended. And oil and yeast mixture. Mix until ball of dough forms, then mix for 1 more minute to knead the dough. Brush top of dough lightly with oil. Cover with plastic wrap and let rise at room temperature for 1 hour. Preheat the oven to 425 degrees F. Line a baking sheet with parchment paper. Set aside. Bring the 10 cups of water and the baking soda to a rolling boil in an wide 8-quart saucepan or roasting pan. Once the dough has risen, turn it out onto a slightly oiled work surface and divide into 4-5 pieces. Roll out each piece of dough into a rope. Slice each rope into 1 1/2-inch pieces. Using a slotted spoon lower a handful of the pretzel pieces into the boiling water and boil them for 30 seconds, flipping them around in the water with the spoon a couple of times. Remove the pretzel pieces from the water using the spoon, drain as best you can, and place them on the baking sheets. 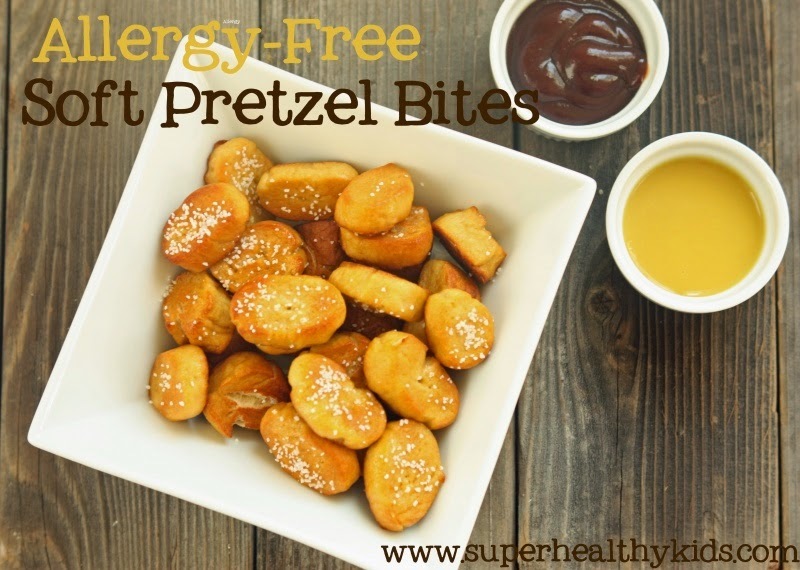 Brush the top of each pretzel with oil and sprinkle with salt. Bake until dark golden brown in color, approximately 10 - 12 minutes. Serve warm with your favorite dipping sauce. Visit their website here. You'll love it too! !